After all the making merry of the Christmas season, I find myself craving salad. Not the chopped iceberg lettuce, white tomatoes and skimpy cucumber slice variety; my hankering is more towards interesting vegetable, fruit and nut combinations topped with tangy cheese and a contrasting, perfectly balanced vinaigrette. Also, part of my salad needs to be warm. I live in eastern Canada on the Bay of Fundy. Today, with the windchill, I’m trying to survive -30*C. I can’t do that on cold food. I thought about this salad for a few days before I wrote the recipe. Part of my workflow is to mull over the recipe and technique until I have it all sorted out in my mind then I execute. Ninety-nine percent of the time what I write down translates, without alteration, onto the plate. Today’s post was no exception. I’d finished shooting –you can see the original final image further down the page – and was tidying up. It was lunch time so I munched as I cleaned. My original recipe used the clementines, simply, to flavour the beets while they roasted. I’d no intention of adding them to the salad. In my head the palate was green, purple and white. However, the ‘waste not, want not’ voice of my mother in-my-head wouldn’t let me turf the left-over clementine pieces so I dumped them on top of my salad. As they fell onto the plate, their underside exposed a gorgeous sticky, caramelized bottom. I stuck my fork into a piece of beet, orange and feta then stuck all of that in my mouth. I had spittle seeping from the corner of my lips. The flavour was off the charts! Clementines are sweet to begin with but, after an hour in the oven, they turn into candy! Line a medium size cast iron skillet with a piece of aluminium foil large enough to hold the beets and clementines and be sealed up. Place beets and clementines in foil lined skillet, drizzle with a couple of tablespoons of olive oil – just eye-ball it – and seal up the foil. Place skillet in the oven on the bottom rack. Roast beets for 1 hour or until a small paring knife can easily pierce through the foil and beet. Don’t risk opening the foil packet to check your beets. The steam could easily burn your hand. Meanwhile, as the beets roast prepare the remaining salad ingredients. Wash the granny smith apple, leave it unpeeled, cut it in quarters, remove the core then slice as thinly as possible. Squeeze the juice from half of the lemon into 1½ cups cold water. Place the sliced apple into the lemon water to keep the slices from discolouring. Place the shelled pistachios in a dry small skillet over medium heat to roast for 5 minutes – toss frequently. As soon as the nuts are fragrant remove them to a chopping board. Chop them coarsely then set aside. When the beets are tender, remove them from the oven and allow to cool for 10 minutes before opening the foil packet. Using a knife, carefully tear the foil open allowing the steam to escape. When the beets are cool enough to handle peel off the skin. I use my hands to rub the skins off but it does leave you with purple palms! Pour the vinaigrette over the beets and clementines and allow to sit for 5 minutes. Divide the salad between four serving dishes then garnish with the apple slices, pistachios and crumbled feta. 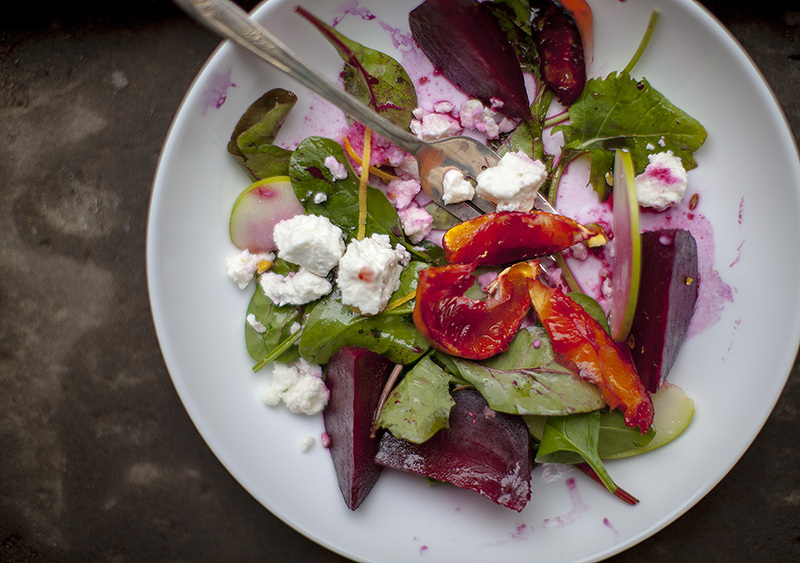 If you were to toss everything together, your salad would be completely purple. Serve immediately with sea salt and freshly ground pepper. Place ingredients in a small mason jar and shake well. THE LOVE: I know this salad seems to have a lot of steps, but trust me, when you’ve finished the flavour is incredible. The quantity of ingredients can be altered to suit your own taste. If you like more cheese or anything else, fill your boots. Take your time and enjoy the process! This entry was posted in salads and vegetables, Uncategorized and tagged beets, clementine recipes, clementines, feta, roasted beet recipes, root vegetable salads, winter salads by Michelle. Bookmark the permalink. I’ve had some wizened clementines in the fridge which would do nicely! I like that you use citrus in the oven and often use your olives and Oranges and pepperino flakes recipe as an sppetizer. This will definitely be on the table this weekend! Thanks, Michelle.